The 1920s was an incredible decade of advancement for communications technology. 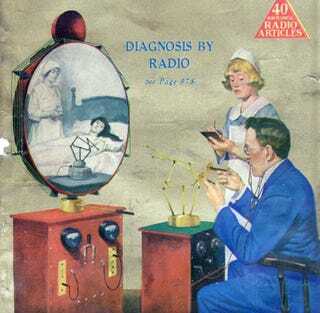 Radio was finally being realized as a broadcast medium, talkies were transforming the film industry, and inventors were tinkering with the earliest forms of television. People of the 1920s recognized that big changes were ahead, and no one relished in guessing what those changes might be more than Hugo Gernsback. Gernsback was a pioneer in both radio and publishing, always pushing the boundaries of what the public might expect of their technological future. In 1905 (just a year after emigrating to the U.S. from Germany at the age of 20) Gernsback designed the first home radio set and started the first mail-order radio business in the world. The radio was called the Telimco Wireless and was advertised in magazines like Scientific American for $7.50 (about $180 today). In 1908 Gernsback put out the world’s first radio magazine, Modern Electronics. Distributed by the American News Company, Modern Electronics was a huge hit and was said to be profitable from its first issue. In 1909 he opened the first radio storefront in New York, supplementing his mail-order radio sales by selling radio parts to amateur radio operators in the city. In 1913 Gernsback started publishing a magazine called Electrical Experimenter, which in 1920 became known as Science and Invention. In the February, 1925 issue of Science and Invention Gernsback wrote an article that would combine his fascination with the future of radio communications and predict a device for the year 1975 that we still don’t see in any practical household form today. Gernsback’s device was called the “teledactyl” and would allow doctors to not only see their patients through a viewscreen, but also touch them from miles away with spindly robot arms. He effectively predicted telemedicine, though with a weirder twist than we see implemented in 2012. The Teledactyl (Tele, far; Dactyl, finger — from the Greek) is a future instrument by which it will be possible for us to “feel at a distance.” This idea is not at all impossible, for the instrument can be built today with means available right now. It is simply the well known telautograph, translated into radio terms, with additional refinements. The doctor of the future, by means of this instrument, will be able to feel his patient, as it were, at a distance....The doctor manipulates his controls, which are then manipulated at the patient’s room in exactly the same manner. The doctor sees what is going on in the patient’s room by means of a television screen. Quite impressively, the teledactyl was imagined as a sensory feedback device, which allowed the doctor to not only manipulate his instruments from afar, but feel resistance. Here we see the doctor of the future at work, feeling the distant patient’s arm. Every move that the doctor makes with the controls is duplicated by radio at a distance. Whenever the patient’s teledactyl meets with resistance, the doctor’s distant controls meet with the same resistance. The distant controls are sensitive to sound and heat, all important to future diagnosis. As our civilization progresses we find it more and more necessary to act at a distance. Instead of visiting our friends, we now telephone them. Instead of going to a concert, we listen to it by radio. Soon, by means of television, we can stay right at home and view a theatrical performance, hearing and seeing it. This, however is far from sufficient. As we progress, we find our duties are multiplied and we have less and less to transport our physical bodies in order to transact business, to amuse ourselves, and so on. The busy doctor, fifty years hence, will not be able to visit his patients as he does now. It takes too much time, and he can only, at best, see a limited number today. Whereas the services of a really big doctor are so important that he should never have to leave his office; on the other hand, his patients cannot always come to him. This is where the teledactyl and diagnosis by radio comes in. Here we see the man of the future signing a check or document at a distance. By moving the control, it goes through exactly the same motions as he would in signing he document. He sees what he is doing by means of the radio teleview in front of him. The bank or other official holds the document in front of a receiving teledactyl, to which is attached a pen or other writing instrument. The document is thus signed. Interestingly, we’d see this idea for telemedicine pop up again in 1990s concept videos from AT&T and Pacific Bell. A year after this article was released Gernsback began publishing Amazing Stories, the first magazine that was devoted entirely to science fiction. Gernsback published a number of different magazines throughout his life, but I’d argue that none were filled with more rich, retro-future goodness than Science and Invention.